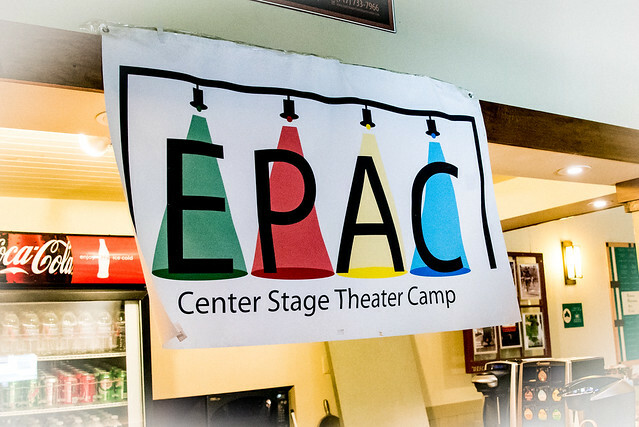 EPAC’s 2019 Center Stage Theater Camp! to present Disney’s Frozen JR! EPAC’s Center Stage Summer Theater Camp, now in its fifteenth year, will fix its primary focus on the overall performance experience as we proudly present Disney’s Frozen JR. This summer campers entering grades 1-12 in the fall will take a weekly, step-by-step journey on the magic of “putting all together.” Our campers will be introduced to various components that are needed to set the stage prior to opening night along with masterclass sessions. Center Stage Summer Theater Camp will now offer the opportunity for our high schoolers entering grades 9-12 to take on an active presence as production ambassadors working alongside camp instructors in a more pivotal role throughout the rehearsal process – from its beginning concepts, to auditions, set and costumes, to its final presentation. Disney’s Frozen JR. is based on the 2018 Broadway musical and brings Elsa, Anna, and the magical land of Arendelle to life onstage. Center Stage Summer Theatre Camp is a 4-week program from July 8- August 2 with two performances of Disney’s Frozen JR. on Monday, August 5, at 2pm and 7pm. For more information, you may call 717-733-7966 or email camp director Irving Gonzalez at kids4kids@ephrataperformingartscenter.com . Scholarships are available. Scholarships are available for camp. If you’d like to apply for a scholarship, please fill out the scholarship application form. Please note; there are limited number of scholarship based on partial, and financial need. This was made possible through the generosity of donors. Deadline for application is Friday, April 5th, 2019. This summer we have intertwined the love of performing with personal artistic growth as we place our focus on the overall performance experience. We found Disney’s Frozen Jr is the perfect outlet to broaden our campers’ theatrical perspective. Each camper will have the unique opportunity to be part of workshopping Disney’s Frozen Jr. Unlike our Junior Productions, campers will have a glimpse of the step-by-step process of “putting it all together” with daily rehearsals and master classes. Campers are not required to attend all four weeks in order to participate in the final presentation of Disney’s Frozen Jr.
With an emphasis on remaining artistically organic and working through a process that emphasizes leadership and individuality, campers will gain a much deeper appreciation of the behind-the-scenes work that goes into producing a theatrical performance. Daily schedule from 9am-3pm will consist of master classes, electives, guest artists, and performance readiness. At the end of each week, campers will showcase highlights from Disney’s Frozen Jr and individual elective pieces. Throughout the four weeks, campers are rehearsing in preparation for the end of the summer performance. Because we are presenting the full-length junior production of Disney’s Frozen Jr, campers will be asked to audition for specific roles. Anyone who would like to be considered for a lead role must attend all four weeks. We will consider those who have registered three weeks. It is imperative that campers are cleared whether they will be in attendance on Sunday, August 4, for a tech rehearsal from 12-7 and on Monday, August 5, performance day with a call time of 11am, as this will determine roles assigned in the show. Two performances 2pm and 7pm. Kristin Pontz is a Lancaster County native and received her BFA in dance from New York University’s Tisch School of the Arts. She has performed and choreographed all over the East Coast in such venues as the NY Fringe Festival, Merce Cunningham Studio, and the North Carolina Dance Festival. Ms. Pontz currently teaches at Elizabethtown College, where she serves as faculty advisor to the university dance group E-motion, and at Dickenson College. She is the Director of Rev9 Dance Company, a modern dance company that performs regionally and is Assistant Director of COBALT Contemporary Ballet of PA. Ms. Pontz has choreographed and served as assistant director for the award winning Hempfield High School Dance Theatre for over 14 years and has choreographed many musicals including EPAC’s production of American Idiot and for productions such as Opera Lancaster’s “Hansel and Gretel.” She is also part of the successful EPAC’s Kids4Kids Family Series Junior Productions as co-choreographer and artistic collaborator alongside Irving. She is responsible for the amazing dance musical numbers known as “Act III” at the end of the show seen in Aladdin Jr and The Lion King Jr.
Zachary Smith is an accomplished pianist, music director and piano teacher in the Lancaster area. He received his MS and BA in Clinical Psychology from Millersville University with a Minor in Music. He has recently music directed Hello Dolly!, Heathers: The Musical and American Idiot at EPAC including Assistant Directing King Lear. He is current music director for the much-anticipated Hairspray musical starring Edward R Fernandez as Mrs. Edna Turnblad this summer. Christine is an actor, singer, director, producer, improv comedian, and costume designer. She is a show director and United Way award-winning teaching theater artist with the Yocum Institute for Arts Education certified in the Children’s Theater Company of Minneapolis Neighborhood Bridges Curriculum. Ms. Cieplinski is a visiting or resident teaching artist and show director at many arts schools throughout the Tri-State region. She has studied Improv with Second City and Leela Improv Training Center San Francisco and performed Improv with Kevin Bull of American Ninja Warrior and Anthony Carrigan of Gotham. She is on the Principal Creative Team of Reading Theater Project, originating theater works relevant to Berks County, she directed their Improv troupe and produced their Penn Street LIVE! Bridging the Arts series. Having worked as the Clinical Director of a forensic therapy practice for 15 years, specializing in criminology and trauma, she produces a semi-annual theater presentation series for V-Day Greater Reading to assist child survivors of crime. Her costume designs have been seen on the Gretna Theatre, Montgomery Regional Theater, Reading Theater Project/Berks Opera Company, Ceres Gallery NYC, and June Havoc Theater NYC stages among many others. Her company, Cherry Herring Entertainment Company, has designed sound Off-Broadway at the Theatre Outlet, Dog Run Rep and June Havoc Theaters. CHEC also produces Interactive Theater for Young Audiences that focuses on critical thinking skills and self-protection. Ms. Cieplinski is proud to be the Chairman of the Board of the Children’s Alopecia Project, an international non-profit organization that helps kids who have lost their hair regain their self-esteem. On behalf of EPAC’s Kids4Kids Youth Programming, we would like to thank you for visiting our webpage. Our mission is to provide our young performers not only a creative outlet but a diversity of opportunities to grow, perform, and awaken their artistic potential. Over the years, we have seen an enormous growth in our youth programming that have allowed many of upcoming youth performers to find their own voice and an exploration of vessels through wonderful experiences. Here at EPAC, we are very proud to offer our youth varies opportunities to gain the spotlight such as our Kids4Kids Junior Productions, EPAC’s Got Talent, The Young Artist Cabaret Series, and our successful Center Stage Summer Theater Camp. Often time our productions are compared to the main stage productions. There our youth performers gain real-life experiences by working closely with top professionals from the areas. We are confident that our youth programming is a never ending revolving door of new experiences, helpful tools and guidance, educational mentorship, and where kids are encouraged to discover their own hidden potential. So rather you are a parent, friend, teacher, or want to get your name in lights, there is a place for you among our young programming. Please contact Irving Gonzalez at camp@ephrataperformingartscenter.com for more information.